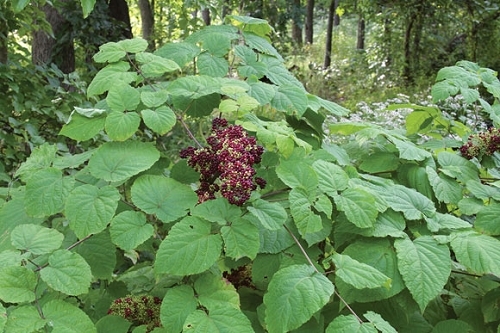 American spikenard is an impressive, shrub-sized foliage plant for shade. 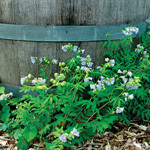 It has large, compound leaves on striking reddish-brown stems and clusters of white flowers in July and August. A slight breeze will cause the plant to sway and dance. The berries are generally considered inedible. However, the roots have been used as an ingredient for root beer; and native americans used the plant medicinally. Spikenard is a great plant for large, decorative containers on a shady patio.